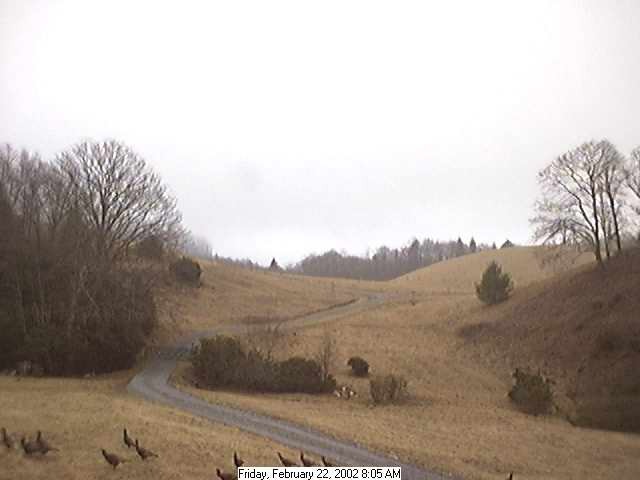 The Ranchcam caught some visitors on camera! I save every frame the webcam sends to this web site to my hard drive. I can then paste them together to make really cool time lapse movies of a whole day (these are currently to big to make available on the web site). While flipping through todays pictures I found that my field had been visited by a very large group of Turkeys! For those of you that haven't seen a wild turkey up close, these guys (or gals) are big, around 3 feet high! This frame seemed to show the most at once, but they just kept coming by. I was in the shower during this time and didn't see a thing! 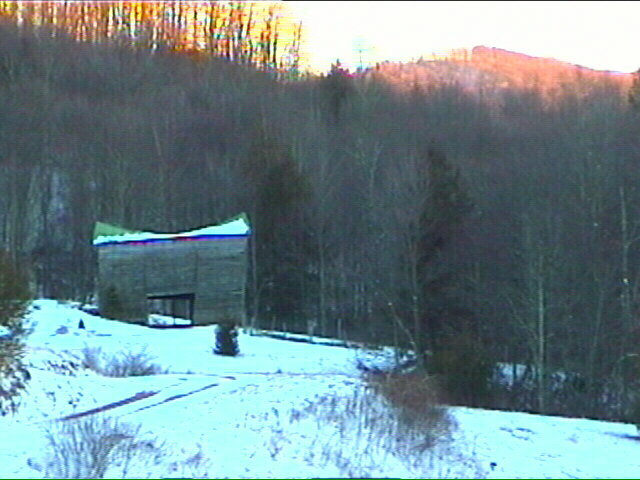 Maybe one of you happened to be looking at 8:05 this morning? Makes me wonder what all I missed before the Ranchcam was watching!? By the way, I hope to one day figure out a way to shrink the size of my time lapse moves so that I can make them available to you. It is amazing to watch a whole day go by in a few minutes! Even with the snow and 9 degree cold we had Friday (3/22/02), Spring is starting to stir in the air at the Ranch and the birds and the bees are responding. 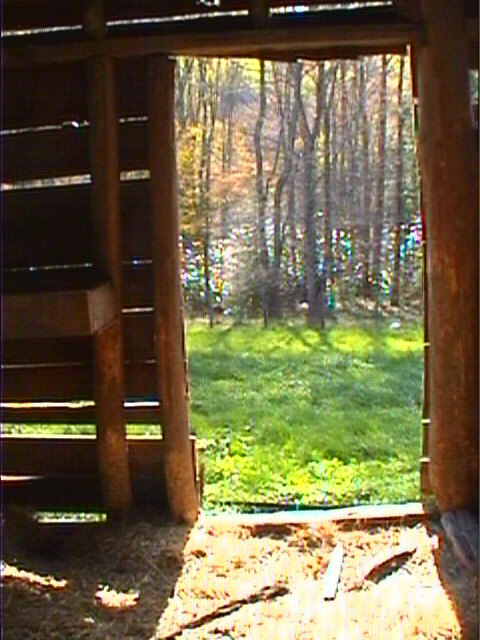 Sunday (3/24/02) I was going downstairs when I looked out and saw Sugar staring very intently out towards the creek and gate. I looked out the living room window and saw what she was looking at, a flock of turkeys! There were 9 hens and 1 gobbler! 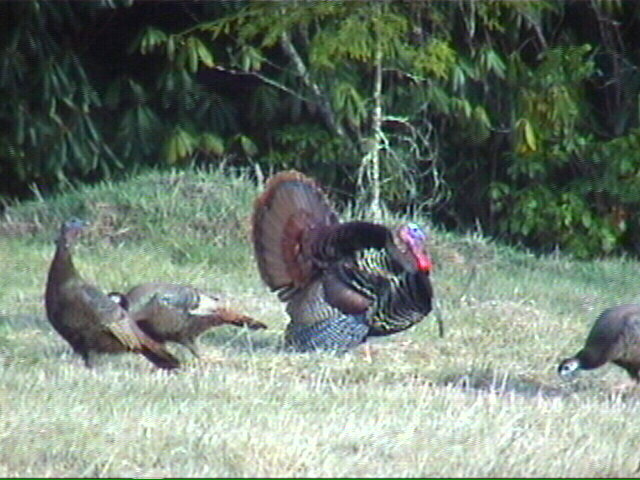 Although I see turkeys all the time at the Ranch, I've never seen a gobbler in all his glory. He was strutting his stuff, doing a little dance with his tail up and his wings down. His face was blue that went to purple, then to brilliant red. His "beard" almost touched the ground. His feathers where iridescent gold, green and brown. Very, very cool. 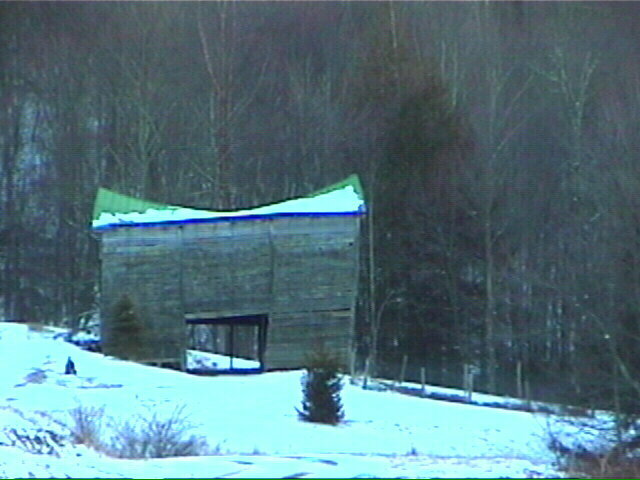 I shot the video this image came from out my living room window while sitting on the chair next to my fireplace! The grouse have also been busy trying to get a mate. The males have been out beating their wings against their chest to attract a female. The low frequency, rapid thumping noise can be heard for long distances. I've been hearing them from inside the house! 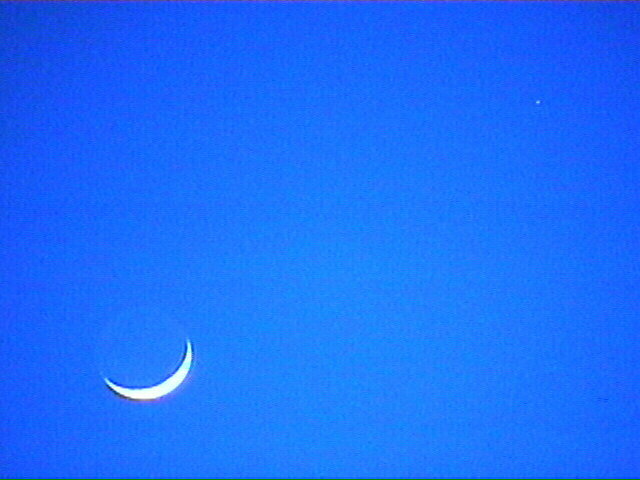 In this shot you can see the crescent moon and Jupiter together in the evening sky. If you look at the moon you can see the "dark" side of it. This is caused by Earthshine. Sunlight reflecting off the Earth is illuminating the dark side of the moon and the moon is reflecting the light back. Many may not understand why this simple picture is under my "Favorite Picture" section. I guess it reminds me of the whole spectacular spring evening that I took this image. Unfortunately, I can't show all that. ... now they are only distant memories, remembered only by a few... and soon this place will only be a memory too... remembered only by a few. 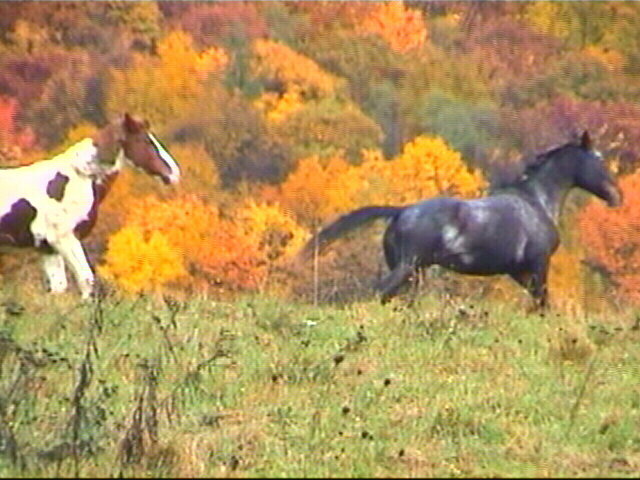 I caught a quick shot of these horses running in the Hay Meadow. The colors of fall and them running is great. This was a very nice scene as I was coming home late one cold and wet Wednesday night. The lit Balsam Fir in my front yard on a cold, crisp Christmas Eve.